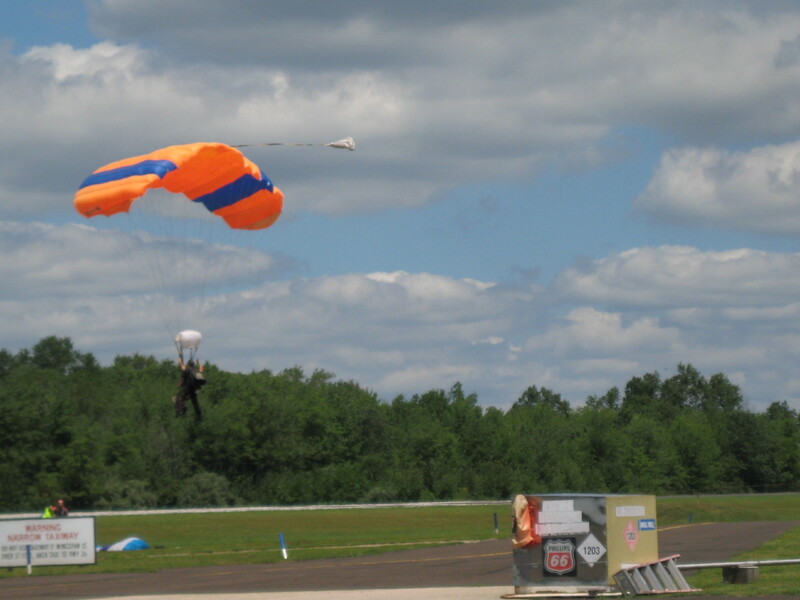 Yesterday we went skydiving with Skydive Philadelphia! It was one of the coolest things I have ever done. I actually set everything up for Dan’s 30th birthday last year but we never cashed in the certificates. After almost a year, and one failed attempt because of clouds, yesterday was finally our day. We drove up to the tiny town of Perkasie, Pa to make the leap. We still have to wait for the video and pictures from the skydive company. I can’t wait to see them, I am sure we probably both look kind of crazy. I yelled the almost the whole way down…not because I was scared, but because it was awesome! I thought the free fall felt like plunging through water. It was so exciting to see the ground below me and not be in an airplane. I thought I would be scared but I felt like I was floating and not scared at all. It was like the very first little part of the hill on a roller coaster but it lasted a lot longer. 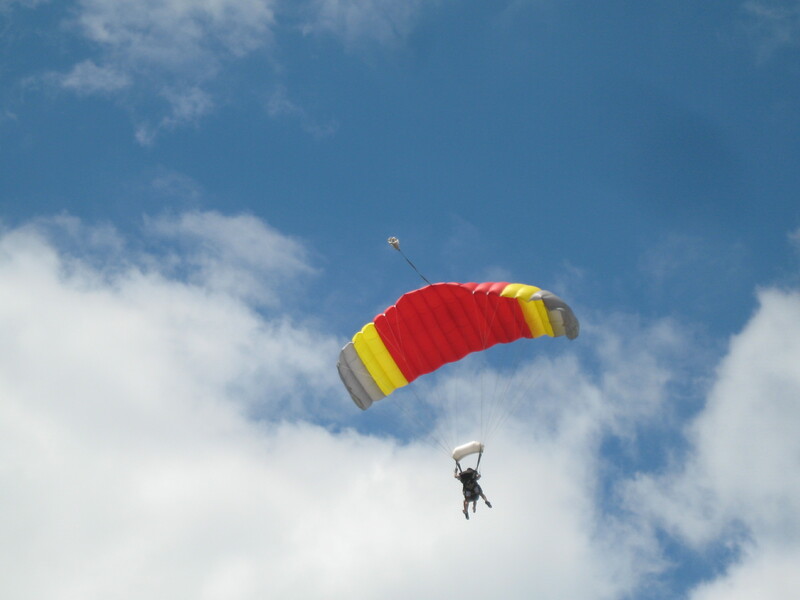 Once the parachute opened it really felt like I was floating. I could see the Philadelphia skyline from where we were, which was pretty cool because we were about an hour away from there. It was also pretty surreal floating above houses, rivers, and a lake getting closer and closer to it all and then being on the ground before you know it. I think it’s the closest I’ll ever be to being a bird in the sky. That’s me landing in the photo above. We survived and had a really great time! After all of that jumping out of airplanes and free falling we worked up quite an appetite. 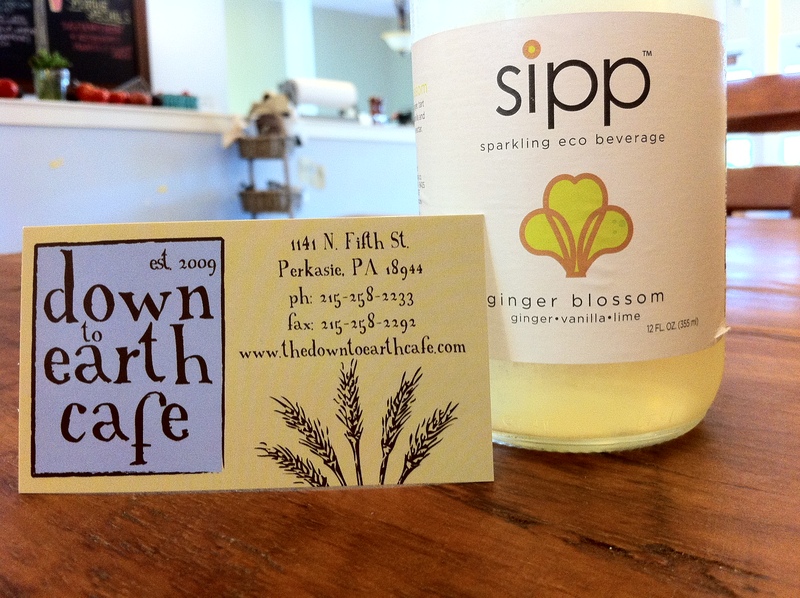 We went to this really great breakfast/lunch place called The Down to Earth Cafe. We it found last time we were in Perkasie about a month ago. 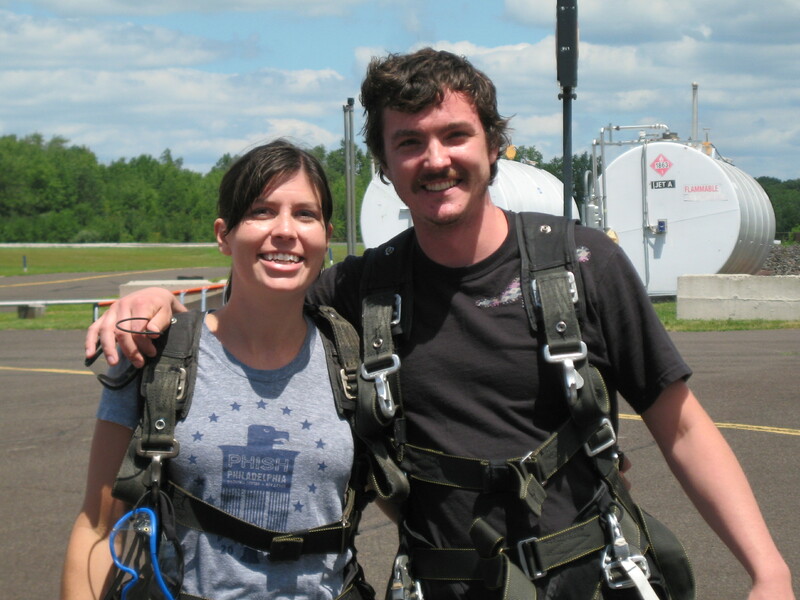 We attempted to skydive last month but there was a thunderstorm in the morning and the clouds never cleared, so we didn’t get to jump… but we had a great lunch. The first time we ate here we both got the special panini made with ham and brie. It was really good and made with very fresh and high quality ingredients. The Down to Earth Cafe uses as many local, organic ingredients as they can. You can tell they really pay attention to quality. They also have a list of daily specials that use in-season ingredients. I wish I could come here of breakfast because all of the breakfast choices looked amazing. They also have a lot of really great drink choices that are made with real sugar and interesting ingredients. I tried this sipp ginger drink that was really good. This time Dan ordered the fish tacos (one of the signature dishes). They looked nicely put together with flour tortillas, House-made red cabbage cole slaw, deep fried seasonal fish fillets, and slices of tomato and avocado. I actually didn’t taste them, which is weird for me because I always want to taste everything… I must have still been over excited from the fall and wasn’t thinking. Dan said they were really good so I’ll have to trust him. I got the panini special again. 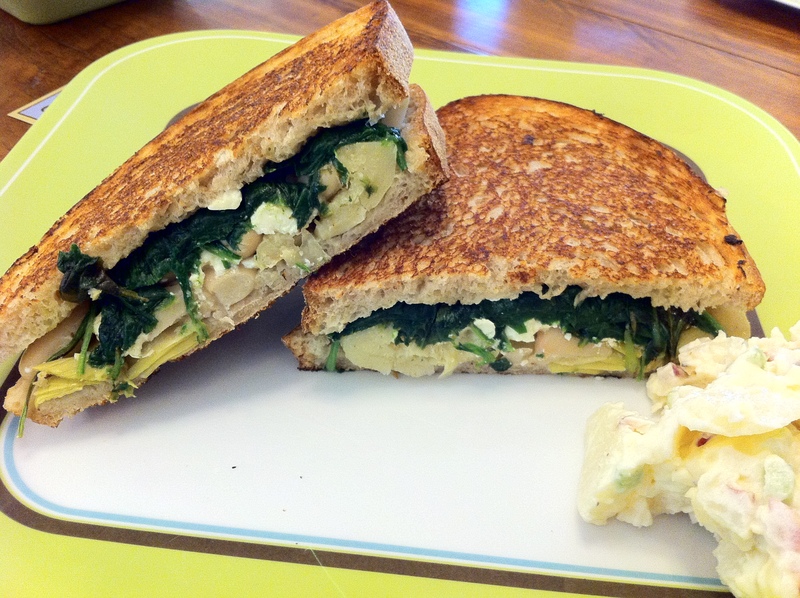 This time it was sautéed spinach, white beans, feta cheese and grilled artichoke hearts all squished between two slices of rye bread. It was a really nice combination. I only added a little bit of salt and pepper. It also came with a side of red potato salad, which was one of the best potato salads I have ever had. The potatoes were cooked perfectly and the dressing was just right, not overly seasoned and not too heavy of the mayonnaise, just a little bit ( I really hate when there is too much mayo on food, I think the consistency is gross). I also got a side of sesame noodles because I didn’t know I was getting a side of potato salad. 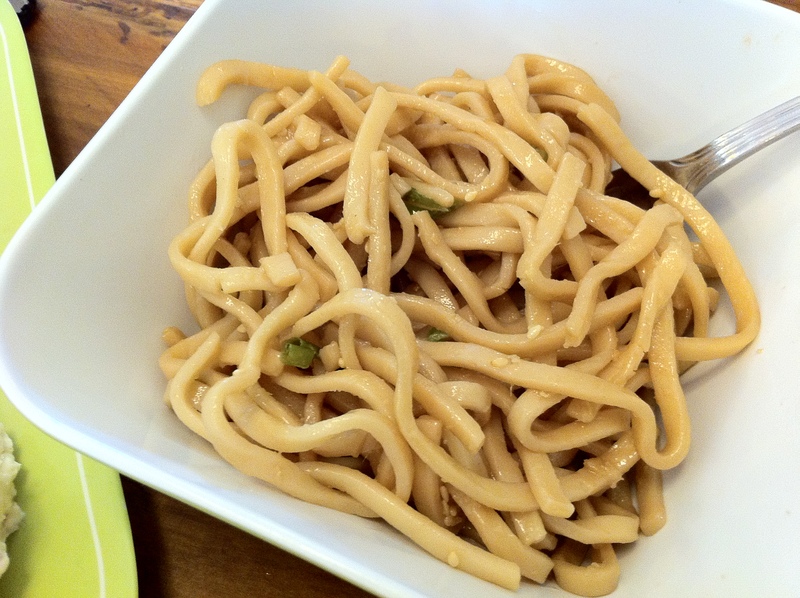 The sesame noodles were also really good, with just the right amount of dressing and seasoning to coat the noodles. Overall, this place is great! I would go back here in a minute if I am ever in Perkasie again. If you find your self in upper Bucks County, it is definitely worth a stop.